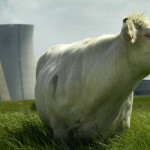 10.12 | Is Belgium able to extend its Doel 1 & 2 reactors? During the Post-Fukushima European Nuclear Safety Stress Tests, civil society has drawn the attention of EU and national authorities to the urgent necessity to update and rescale the existing EP&R provisions in the EU. With the new BSS directive, NTW calls on the Commission to ensure an effective and qualitative transposition and a civil society involvement at the earliest stages of this process. On 30 November 2015, an agreement between Electrabel and the Belgian Federal Government was reached to extend by 10 years the lifetime of nuclear reactors Doel 1 & 2. 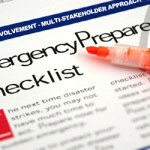 But it breaks international rules for transparency and safety, as ensuring an environmental impact assessment process. Lifetime extension of power plants must take into account a high level of safety measures to protect the population, but also the environment. NTW supports the RICOMET’s call “Appeal to implement Responsible Research and Innovation in Euratom nuclear research, development and activities”. During core scientific and nuclear research and development, NTW highly recommends the incorporation of activities to broaden the social, participatory and ethical dimensions. We need social sciences to understand the nuclear world. The Commission has started an effort called E-Track for the promotion and enhancement of public participation in the implementation of energy policies. The first project is about radioactive waste management. 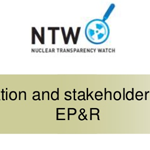 One and a half years after E-track setting up, NTW shares the Advisory group concern about the current state and future of the project: inadequate resources, limited use of information collection, the lack of political support, etc. On 3 December 2015, a workshop “More effective EP&R arrangements at the EU level under the BSS Directive” was organised by the European Commission. NTW was invited to give a presentation on public information and stakeholder involvement in EP&R, made by Nadja Zeleznik. It was an opportunity to stress the importance to engage civil society in each step of EP&R and to take into account CS recommendations. 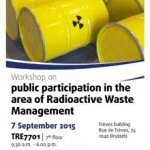 On 7 September, the EESC organised a workshop on public participation in the area of Radioactive Waste Management. This workshop was an opportunity for reviewing initiatives and practices with regard to public participation in RWM across the EU. Discover two presentations made by Philip Kearney and Paul Dorfman, setting the scene and highlighting the importance of transparency and public participation in RWM. A new project with two reactor units from Rosatom is planned as an addition to the existing four-block nuclear power plant, Paks-1 that currently generates some 40% of the Hungarian energy production. An environmental impact assessment (EIA) procedure for this project is currently being conducted. 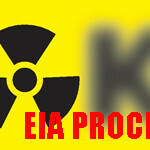 An EIA Report has been submitted and public hearings organised. NTW has compiled the available feedbacks. Nuclear Transparency Watch is pleased to announce the arrival of new NTW members: Piotr Stankiewicz, NTW qualified member (Poland), Josep Puig, NTW representative of Grup de Científics i Tècnics per un Futur No Nuclear (Spain) and Gabriele Mraz, NTW representative of Austrian Institute of Ecology (Austria). 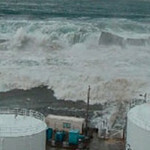 Nuclear power plants already face issues that may be related to climate change: floods, heat waves, storms, invasion of jellyfish and seaweed, rising sea levels, etc. With global warming, some of these natural events may be more severe. Events like floods or heat waves can have a serious impact on their cooling system. Is the European nuclear fleet ready to face those threats? Two years ago, a significant portion of civil society delegates to COP19 simply walked out. They had agreed to leave the COP19 together to denounce the perceived closeness of governments to industrial lobbies, and to express their rejection of the false solutions. The COP 21 seems to offer to multinationals advertising opportunities and privileged access of economic agents to policy makers and the negotiations space.